Lod firefighters battle five fires in one night, investigators suspect fires were intentionally set. Firefighters rescued seven people from five fires that broke out in different locations in Lod on Sunday night, in stairwells, vehicles, and an apartment in the city. 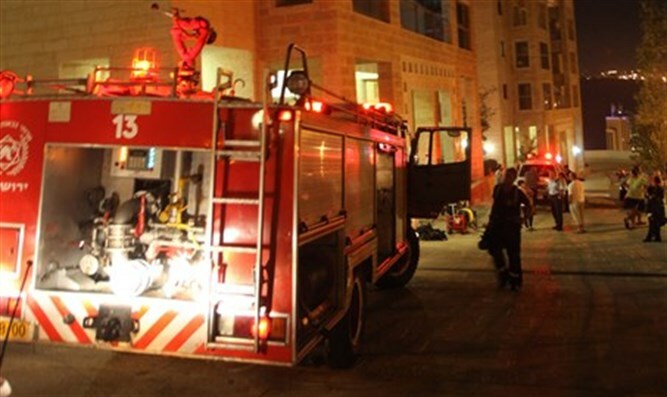 A woman who was rescued from a fire in an apartment suffered from smoke inhalation. At the same time, several vehicles in the city caught fire and firefighters were working to put out a fourth fire on Weizmann Street. The vehicles were located on two different streets, with several vehicles involved in each fire. Teams from all the firefighting stations in the area were sent to help in the firefighting efforts, and succeeded in controlling the flames. Investigators currently suspect the fires were intentional.